HEY! It's Thursday!<3 Thank you so our beautiful Amanda for hosting #TOLT! I was in a *sentence per picture* kind of mood, so it's short and sweet. MUAH. 1. Sophia is now a Brownie Girl Scout, which makes her our brand new source for ALL OF THE Girl Scout Cookies. 2. This kind of explains a lot. 4. Seven solid days of being at my new age, and I'm already over it. 5. True story: I did this with my house key for the first time ever for yesterday's run. 6. Dearest Chicago -- GET YOUR ACT TOGETHER. 7. Sometimes the best thing you can do is let a first grader be a first grader (and make a creepy face). 8. A follow-up to number 6. 9. Found in the Women for Tri Facebook group. 10. It always makes me feel good to end on a positive note. In ONE SENTENCE, tell me one thing you love about running/working out/fitness/lifting/whatever exercise worthy! Weekend plans--as you will discover today, every day is my weekend! And don't even think about asking me to buy girl scout cookies. They are kryponite and I won't have them in my house. I've never tied my key to my shoelaces. Possibly because we have 3 keys for our house. Possibly because I'm all about the pockets! That cone in the hole, though... lol! That's brilliant, especially being upside down. And I always want to try tying my key to my shoe, but I feel like I'd constantly be looking down to make sure it's still there. I took out one loop, put the key on the string, then re-looped it and tied it. No worries! Bahhaha to the cone in the hole...So classy. That's bound to end terribly. It hasn't for me, so far! I've never tried the key in the shoe laces trick. I'll have to give that a whirl one of these days. Most days, I just love running as an excuse to get out of the house away from my family. It sounds terrible, but it's truly necessary for my sanity. Girl, that doesn't sound terrible at all. :) We all need it! OMG! The traffic cone?!?! My husband does the key thing. I stick mine in my phone arm band or some of my running pants have a zippered mini pocket for keys. I love that! I hear ya'! Pockets are usually my go-to for key storage. Holy crap, that traffic cone...that's a lawsuit waiting to happen. Glad you didn't step in it! 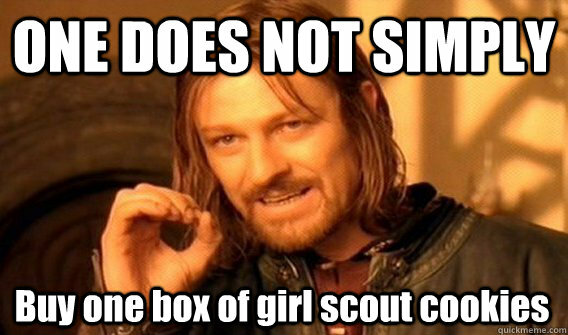 I don't know how families of Girl Scouts handle having all of those boxes of cookies around. I'd be like, EAT ALL THE COOKIES! What I love about working out: The feeling of satisfaction that I get from working hard. Reading this made me realize how sad it is that I could live off GS cookies. Wow! That's a lot to contend with! Ha! This made me laugh out loud. I aim for all of the LOLs!